Garden furniture, whether made of stone, wood, or metal can also add an element of art to the garden. Metal furniture for the garden, first hand crafted and later machine-made, has long been used in the garden. Wrought iron and cast iron furniture can both look alike, but are made quite differently. As with many forms of art work, nineteenth century mass production may have decreased the quality of items like clothing, shoes, and furniture, including tables and chairs for the garden, but also more people could afford the item. Notice the metal table and chairs I feature in the center of my garden. [below] Though they may look old, and present even an antique charm to the garden, they are an example of available garden furniture, made in a cast iron process that makes the cost less expensive. This cast iron table and chairs decorate my back garden. Garden furniture can still add a touch of art, whimsy, and also a sense of welcome to a garden. I think that the Robert Wood foundry in Philadelphia produced cast iron garden furniture between 1804 -1858. Barbara, that period for making cast iron garden furniture makes sense from what Leopold says in her book. Thanks for the comment. 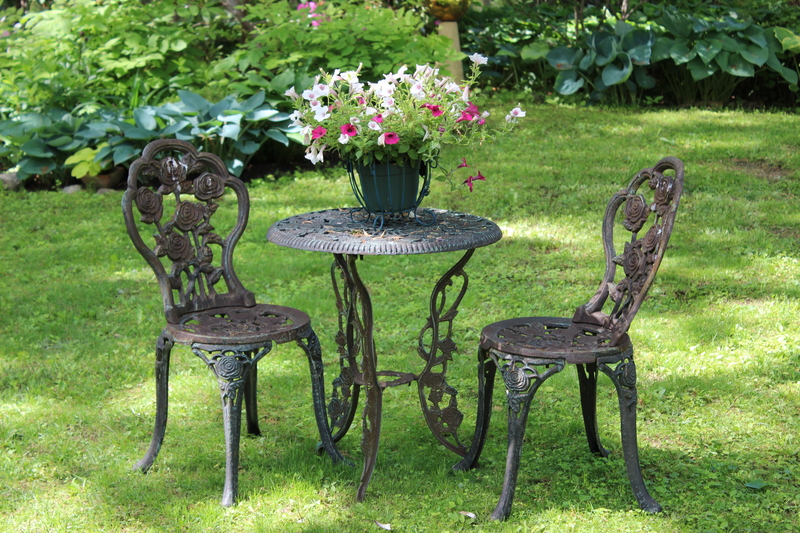 BEAUTIFUL…….I adore garden furniture especially the antique stuff! Thanks for responding. I too like this kind of furniture in the garden. It adds so much charm to the plants that surround it. Furniture like this can be like a welcome mat to the garden.